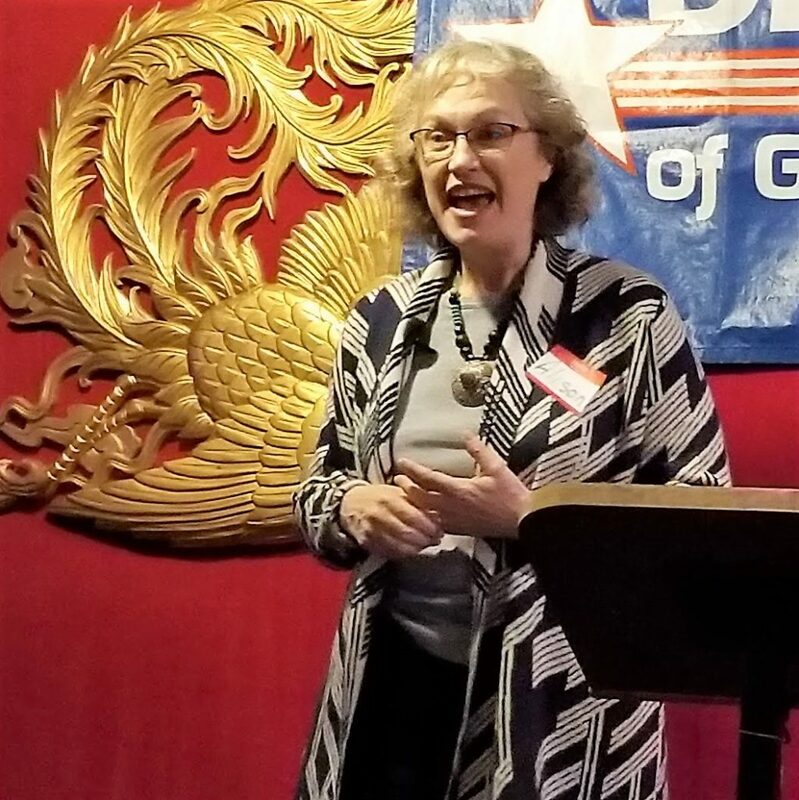 Only 50 hours after being elected Pima County Democratic Chair, Alison Jones vowed to embrace community groups that helped elect Democrats, and to hold an outreach summit among the County’s six Legislative District leaders. 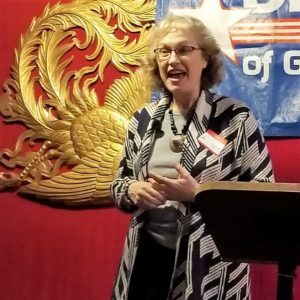 “I have a lot of support in the room and I’m charging ahead,” she said at Monday’s meeting of the Democrats of Greater Tucson. “I’m excited about the possibilities.” See In a Surprise Victory, Alison Jones Elected as New Pima Democratic Chair 156 to 151. One of her first projects is to find a replacement for outgoing Executive Director Heath Butrum. “I want someone with budgeting and personnel skills, who is very organized with logistics. We need someone who will create a welcoming tone at headquarters, and someone who is excited about spreading our message of inclusivity,” Jones said. Butrum’s departure date is flexible. Jones is a career hydrogeologist who has been president, secretary, and treasurer of the Arizona Geological Society. “All these skills are directly applicable to the chair position,” she said. She has been in Tucson since 2006, arriving from Maine. In her work, she consults for Tucson Water designing wells and assisting mining companies with permits. “I’m a geologist and science freak,” she quipped. Build a county platform. “We need to stand for something. Millennials don’t care if you have “R” or “D” behind your name, but they want to know where you stand on climate change, gun laws, and skyrocketing education costs. 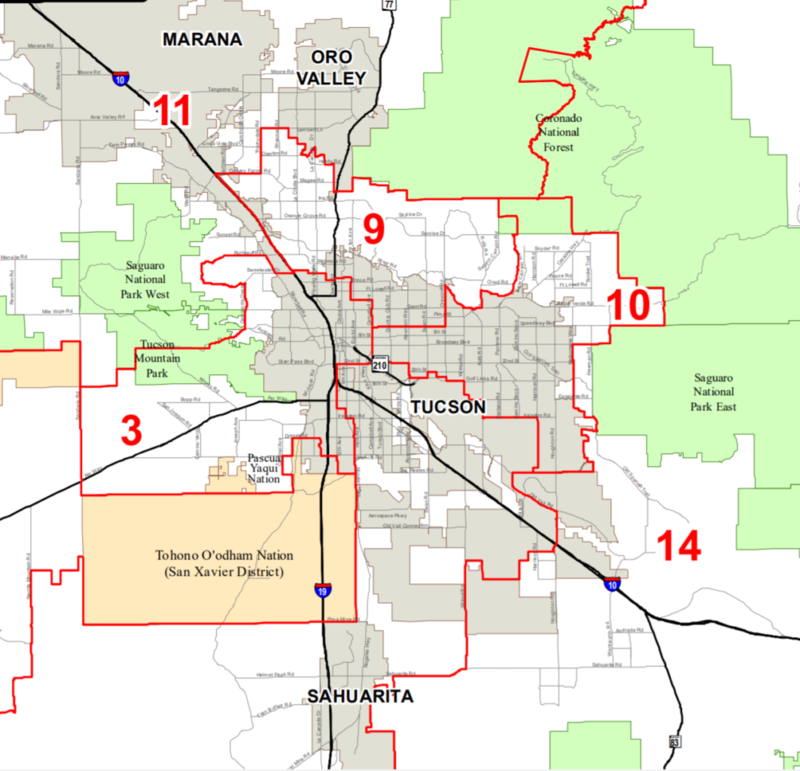 Our platform will be specific to Southern Arizona. She will create a county platform committee. Recruit and train 1,200 precinct committeemen (PCs). Because so many Democrats voted in the last election, Pima County’s allotment of PCs grew to 1,800. Currently, there are 425 PCs. Create a Speakers’ Bureau so PCs will amplify the party message. Boost Advocacy. Train PCs and volunteers to use the Request-to-Speak system to comment on pending legislation. She noted that the YWCA is holding Progressive Candidate Training starting on Feb. 9. Build a bench of candidates by recruiting and training candidates. Improve fundraising. “I want to beef up the Catalina Democrats,” who pledge to give $1,000 per year to the party. Jones’ first meeting of the Pima County Executive Committee is Monday, Jan. 7, 2019, at 6:30 pm at the Pima County Democratic Party headquarters at 4639 E 1st St, Tucson, AZ 85711. Great goals. I wish her success. Can we assume she is a Catalina Democrat? Do only Catalina Democrats have skin in the game now? I don’t know either of the candidates who ran for chair, and I plan to continue contributing to Democrats and voting for Democrats. So we now have traded a full time chair for a part time one, one moreover who has not one single idea how things have been done or even what has been done. Expect to spend the next year watching her reinvent wheels Jo had half way around the track. Why not give the new chair and the new officers a chance?